There’s a battle waging deep within your mind. You may not be aware of it, but subconsciously… it’s always there. Almost every day it seems, your computer prompts you to update its software arsenal. But you’ve always got a choice to make. And the opportunity to update to the latest and greatest carries both a blessing and a curse. Advantage: Your computer should work better than ever. You’ve got the best chance for all your software to play nicely on your desktop if every piece is up to date. You generally tend to have problems when you run into ‘compatibility’ issues. Face it… you’re doing brain surgery on your computer. Occasionally, you’re updating the whole operating system. Either way, you’re messing with your computer’s noggin. If it ‘ain’t’ broke, why fix it? And to be frank, the fear of update glitches causing catastrophic computer failure regularly prevents me from going for the update. And who really ever has ‘the time’ to handle that stressful moment when your computer suddenly goes dark? But sticking your head in the digital sand only works for so long before you realize you’re two operating systems back, and you’ve been fooling yourself that your computer isn’t sluggish. You can delay your software updates… but only for so long. The alternative is ultimately computer obsolesce. Usually something compels you to finally take the plunge on the big software updates. For me, my Mavericks moment arrived rather suddenly when I tried to update my sluggish Aperture photo editing software, but couldn’t because it required the power of Mavericks. It was time to welcome in OS X 10.9. If you’ve got a few spare hours over a weekend to be your computer’s wingman, it’s the perfect opportunity to face this gauntlet together. And you’re going to want to nurse your computer through its brain surgery. So it didn’t hurt when I became housebound this past weekend due to the season’s first snowstorm. There are a variety of websites offering step-by-step instructions on how to prepare for an OS upgrade such as. While they provide an exhaustive list on every step possible to ensure success, it can all become a bit overwhelming. The complex series of precautions add fuel to the argument of doing nothing at all. Honestly, I found it too daunting a process to follow every safety suggestion. Upgrade all your current software via the Software Update utility before taking any big leaps forward. I use Time Machine locally with an external hard drive and CrashPlan to the Cloud. Then do some system maintenance in Disk Utility. Click on Repair Disk Permissions and Verify Disk to make sure your Mac is healthy enough for its upcoming operation. 11:46am: The upgrade begins. Download Mavericks from the App Store. 1:55pm: Look for paper bag to hyperventilate into. 1:59pm: Computer takes pity and moves on to the next screen. 2:15pm: Installation completes. iMac reboots and proudly display’s its new ocean world. 2:18pm: Computer complains that I’m missing Java and asks if I want to download the latest version. 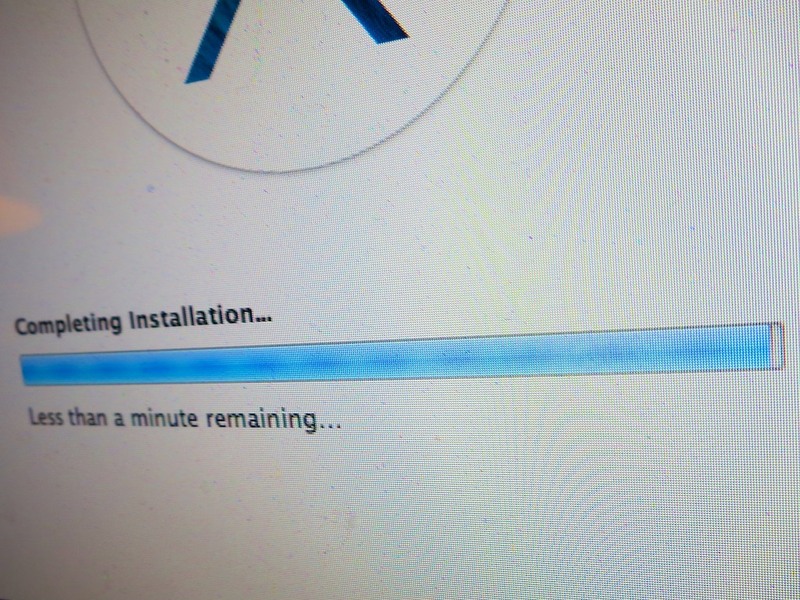 2:20pm: Check for more recent software updates for Mavericks. Only find updates for Mail and iBooks. 2:25pm: Try printing a photo. Uh oh! Suddenly, my printer permissions are installed incorrectly! iMac politely asks if I’d like to fix them. 2:45pm: Successfully upgrade to Aperture 3.5.1. 3:00pm: Blood pressure returns to normal. I’m proud to report that Mavericks has been humming along just fine. And yes, Aperture does seem to act a little zippier now. I’d label this little weekend tech project a success. Half way through the upgrade, I did wonder how my blog post would fare if I had to spend the rest of the weekend trying to breathe life back into my iMac. Not sure what it would say if my 100th post didn’t make it to the finish line. So in this holiday season of giving, why not give a little love to the most important pseudo-sentient entity in your life. In all the excitement of celebration, just be careful not to spill your cup of Joe on it!